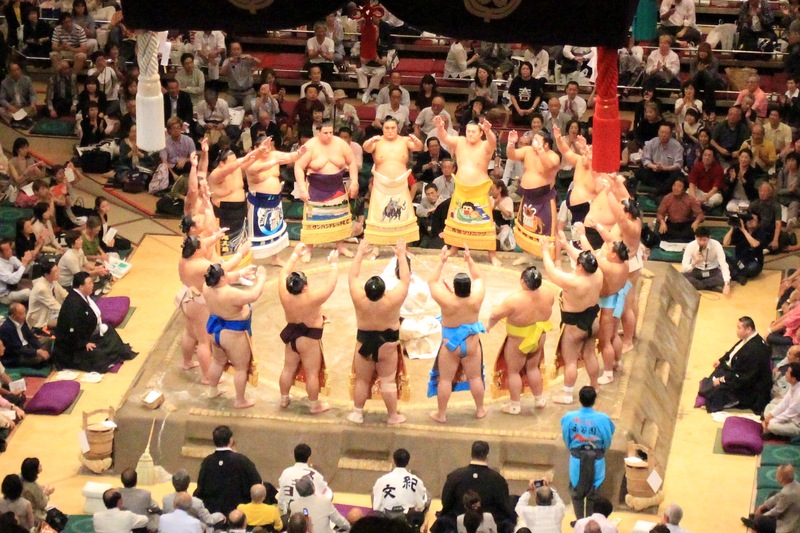 But when a group of enthusiastic co-workers rallied to go to the Grand Sumo Tournament at the Ryōgoku Kokugikan, hell yeah I wanted to go. I’m fickle like that. The point is… I had no idea what to expect. Foreigners like it but Japanese cool kids don’t? Herrrmmmmm. Here’s a quick and dirty history and a few of the rules in sumo for those who know nothing like me. And before the hard-core sumo experts road rage in the comments, here’s a warning: this is in no way a complete reference. 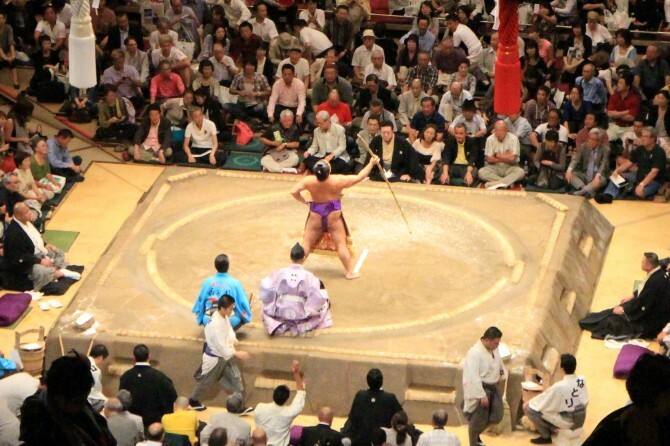 Sumo is thousands of years old, but really became a professional sport back in the 1600’s. It’s deeply couched in Shintoism. Shinto as a religion was constructed to promote agriculture bounty. 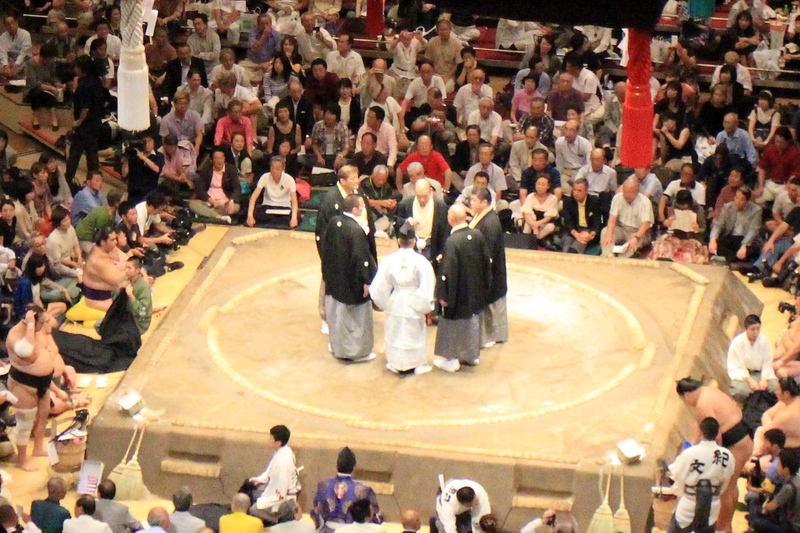 From salting the ring to purify it to the bow dance at the end, sumo rituals are replete with agricultural symbolism. Originally, it was a test of strength and ritual performance orchestrated to entertain the kami (gods). Tournaments have been held in Osaka, Fukuoka, and Nagoya. In Tokyo, tournaments have been held almost exclusively at the Ryōgoku Kokugikan. Since the 1950’s, six major tournaments are held each year. 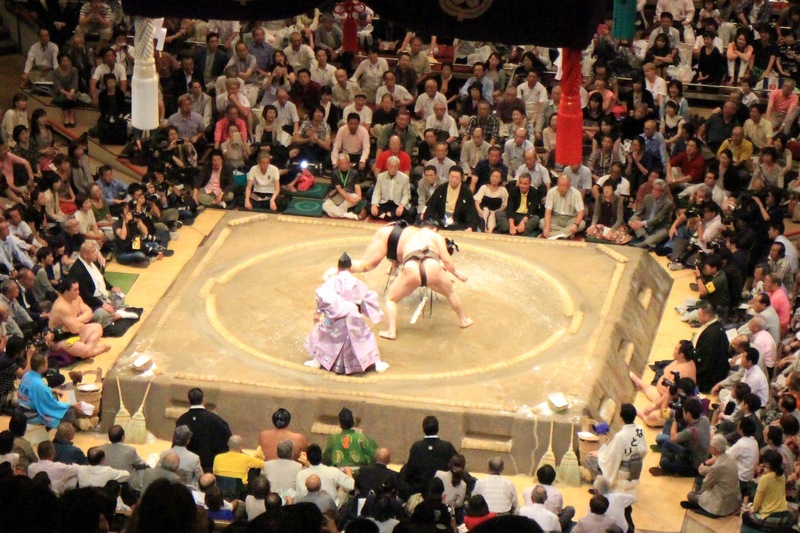 He pushes his opponent out of the dohyo (the ring). He gets his opponent to touch the ground with any body part other than the soles of his feet. There are additional, lesser rules that can cause the five outside judges to confer with the gyōji (ref) on who the match winner is. Matches are fast—less than a minute—so if both guys hit the ground at the same time, it can cause a conference to declare the winner. Not being able to read or understand what the gyōji was saying made it hard to follow exactly what was going on, but that didn’t take away from the awesomeness of the tourno. First off—these guys are huge. Some are obese, but some are pretty jacked under a layer of fat. These are the guys I’d put my money on. 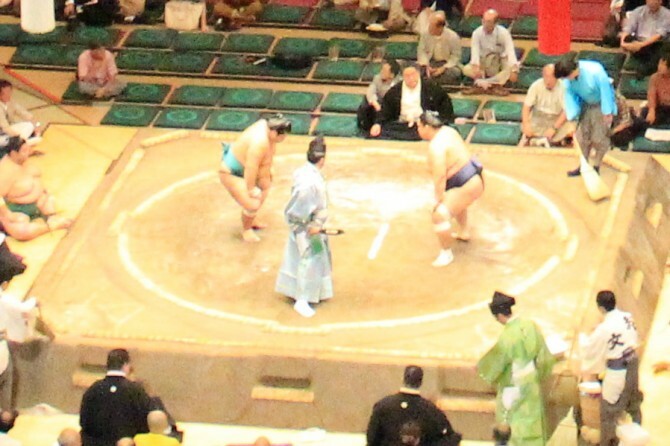 I’m no expert, but sumo appears to lot more than ritualistic posturing and brute force; there was a lot of psyching out of opponents and real strategy going on. Get your opponent totally pissed off for a few minutes, get beyond ready to rumble, then jump out of his way so he tosses himself out of the ring. The final match was between Hakuho, the yokuzuna (champion) and Toyohibiki, a maegashira (fifth highest rank) who had four wins and four losses. The match literally lasted three seconds, with Hakuho defending his title. Here was the move that turned Toyohibiki into the shinitai (dead body, or loser). Religion and history, strategy and strength, sumo is anything but boring. Maybe it’s just because I’m not from around here, but it seems like a cool and brawny lens through which to see this nation’s culture. If you want to make your sumo dreams come true, check this out for more information. Kane Robert’s blog also has great information on the September Grand Tournament. If you want to learn more about the terminology, history, rules, and lives of sumo, check these out.